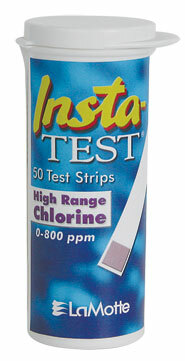 Lamotte high range free chlorine test strips. Test free chlorine from 0 - 800 ppm in steps 0, 50, 100, 250, 500 & 800 ppm. 50 test strips per vial. Dip and read.